I just started a new Player Collection. 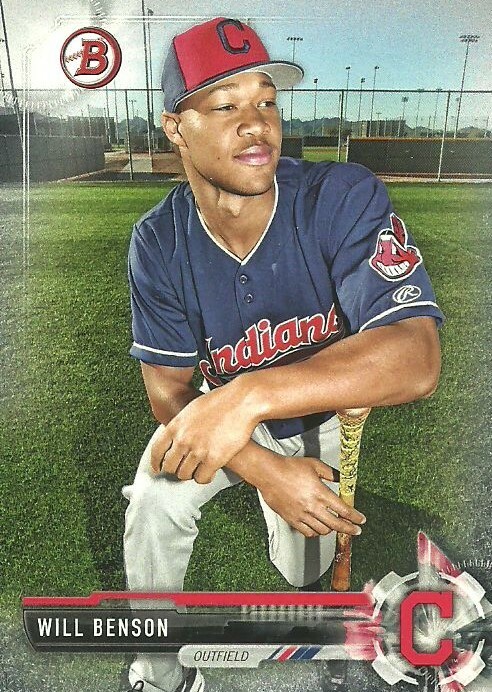 It's of Cleveland Indians prospect Will Benson. 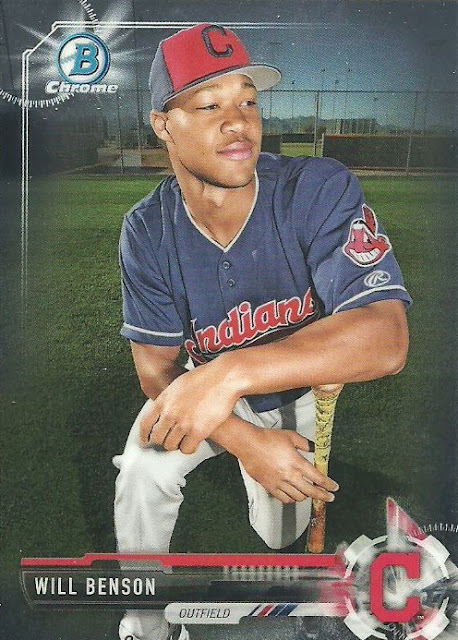 Benson was the Indians 1st pick, and the 14th pick overall in the 2016 draft. Benson started his professional career in the Arizona Rookie League after being drafted and I retrieved his first home run ball and after a bit of an ordeal I gave it back to him for a pair of signed batting gloves. Benson is in Single A so he still has a ways to go before he makes it to the big leagues. 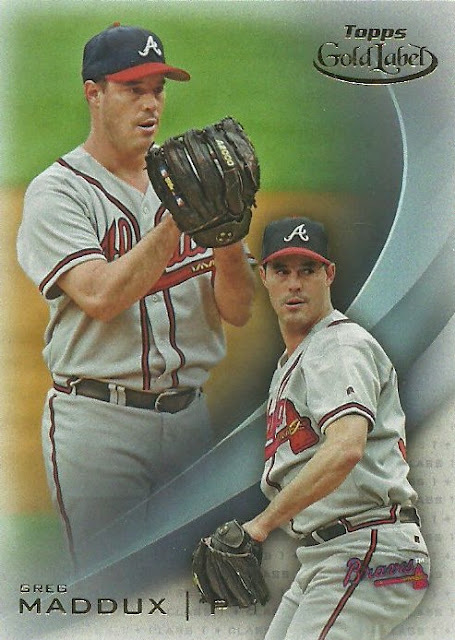 I found these two cards in a 15/$1 box at a card shop recently and it gave me the idea of starting 10 Cent Player Collections; meaning if I can get the cards of certain players for 10 cents or less, then I"ll pick them up. 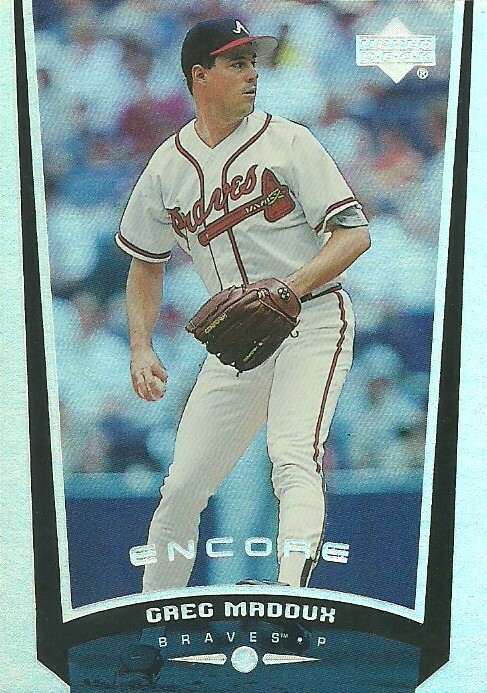 More than 10 cents, forget about it. 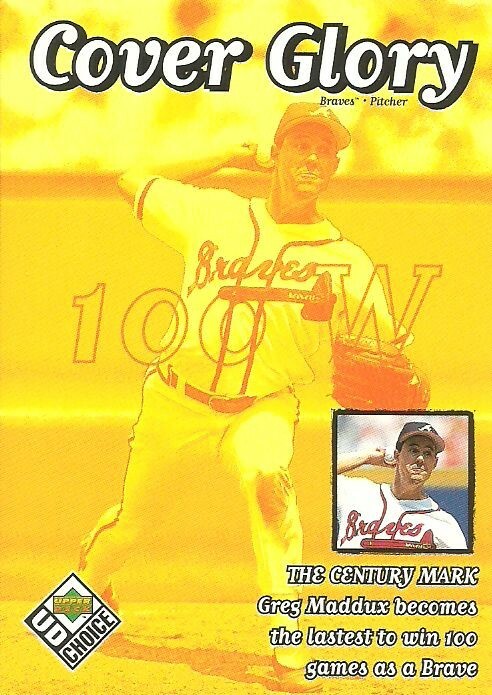 So here's my current list of 10 Cent Player Collections. 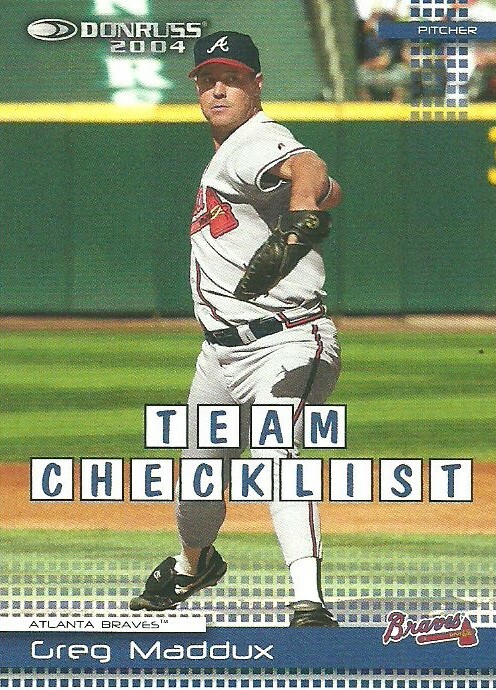 I'm sure I'll add to the list. 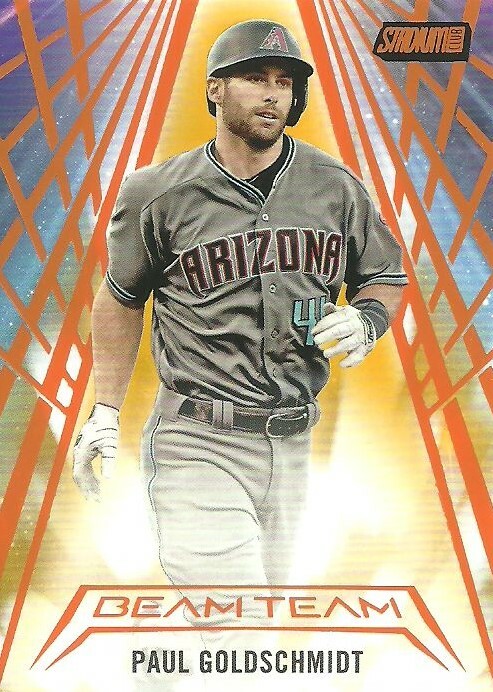 How about you, do you have anyone like this that you collect but only when you can find the cards at a certain price point? With nearly 500 unique Paul Goldschmidt cards in my collection I've come to a realization that I don't need to have every Goldschmidt card ever made. 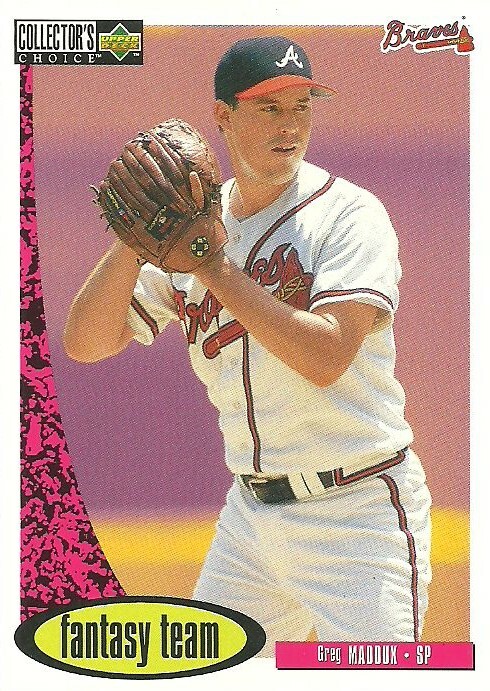 There are just too many and I don't have a big enough budget to be able to go after them all. 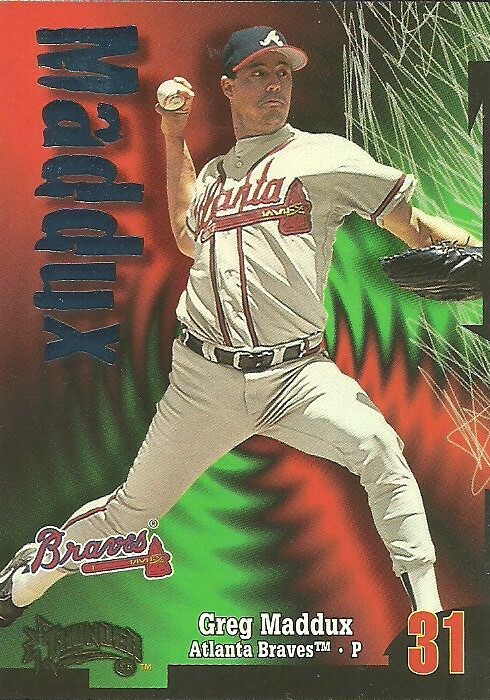 I'm going to focus on cards that I find appealing. Now don't get me wrong, if I come across Goldschmidt cards on the cheap I'll pick them up, but I'm not going to try to get every autograph or every parallel out there just because it's Goldschmidt card. 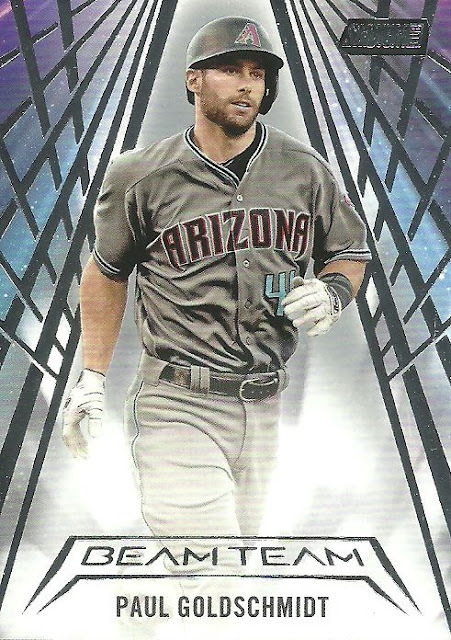 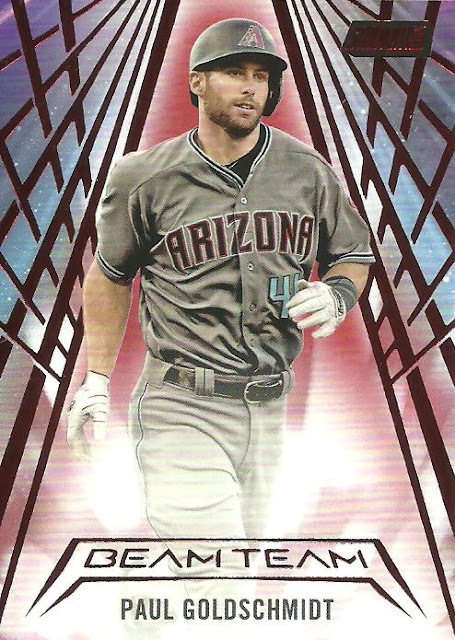 When 2018 Stadium Club was released and I saw the Beam Team inserts featured Paul Goldschmidt I knew that this was a Goldschmidt card that I wanted to add to my collection. I've been picking up the non-autographed versions on ebay over the last couple of weeks. 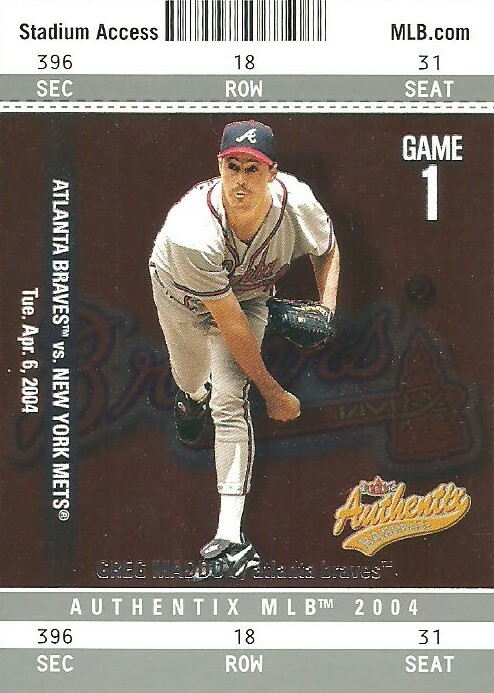 So I've got the base, the red (one per case), the black (numbered to 99), and the orange (numbered to 50). 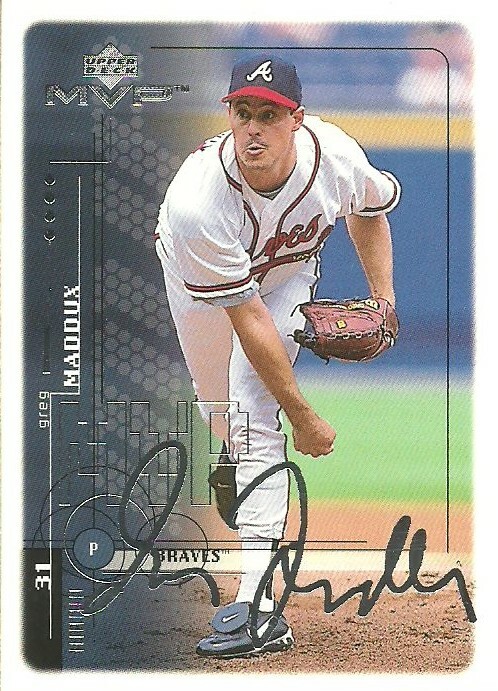 The only other non-autographed, regular version is the 1/1. 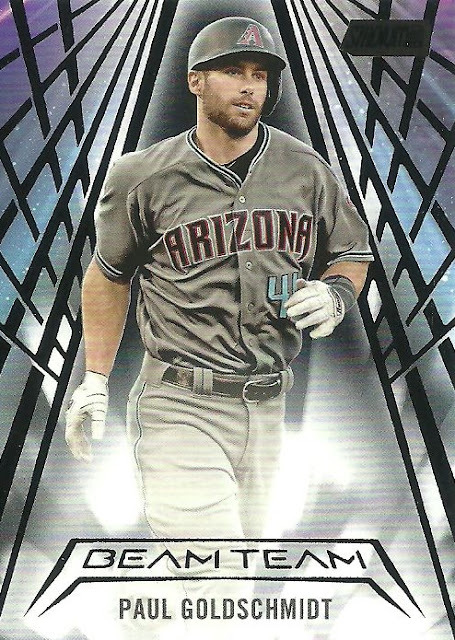 In addition to the autographed versions there are several 5 x 7 versions that Topps sold online. I'm content with the partial rainbow that I've been able to put together. 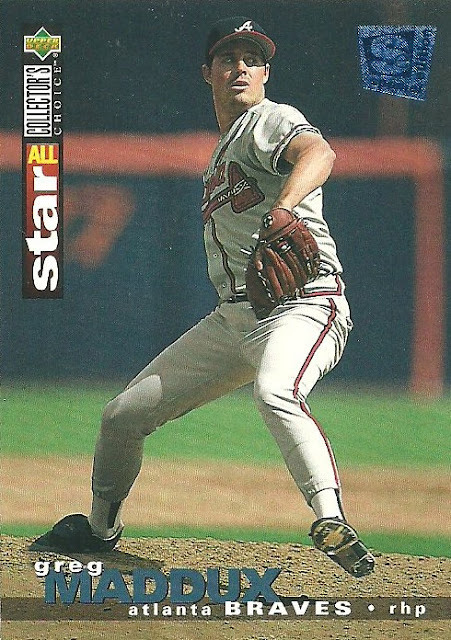 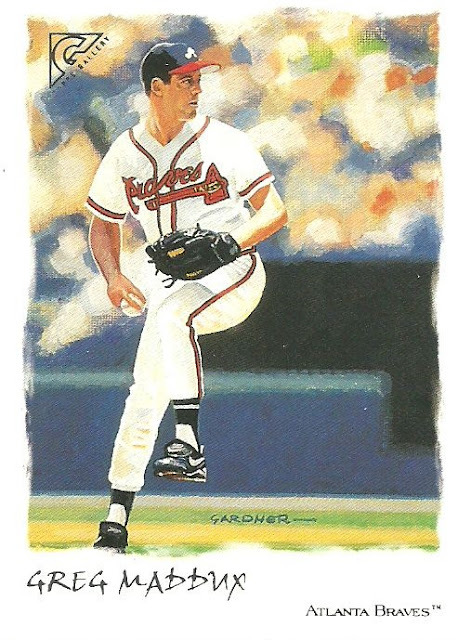 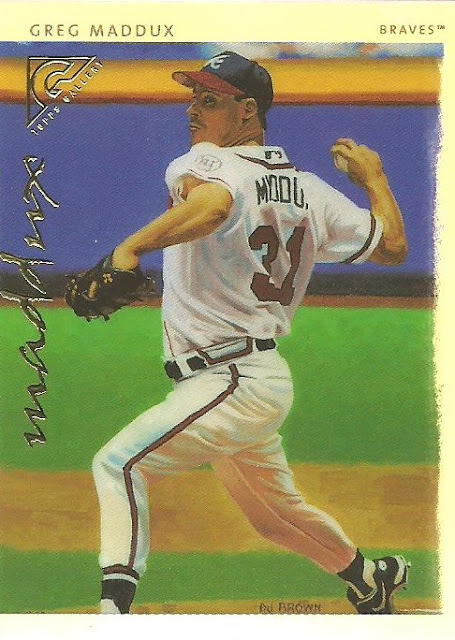 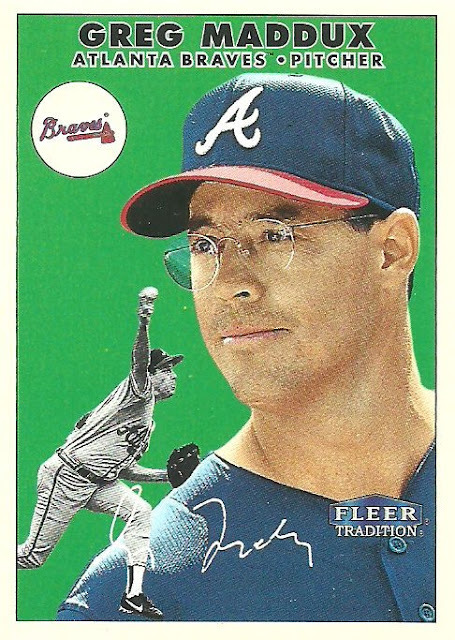 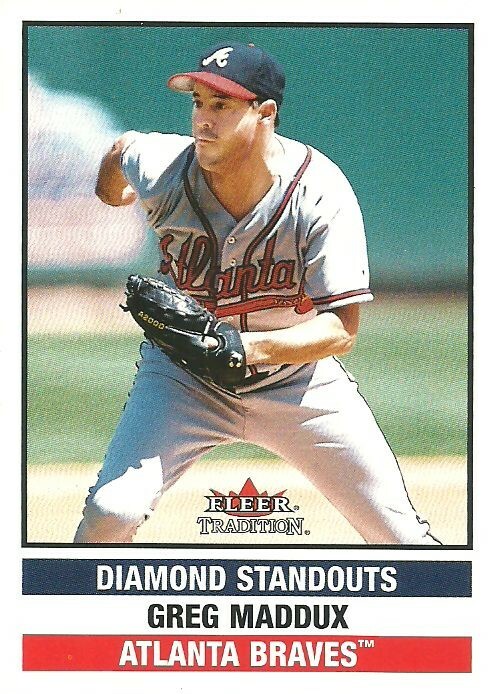 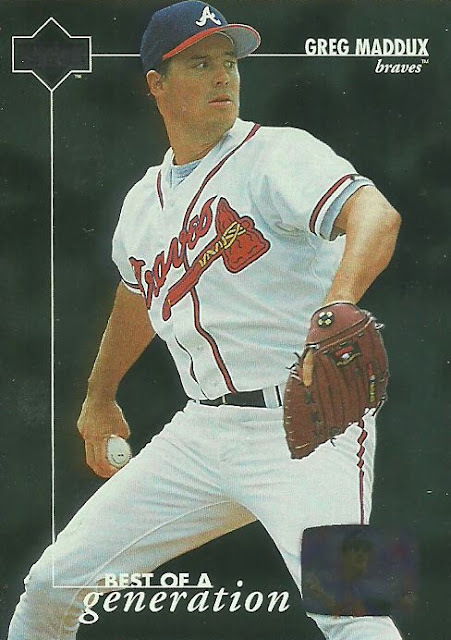 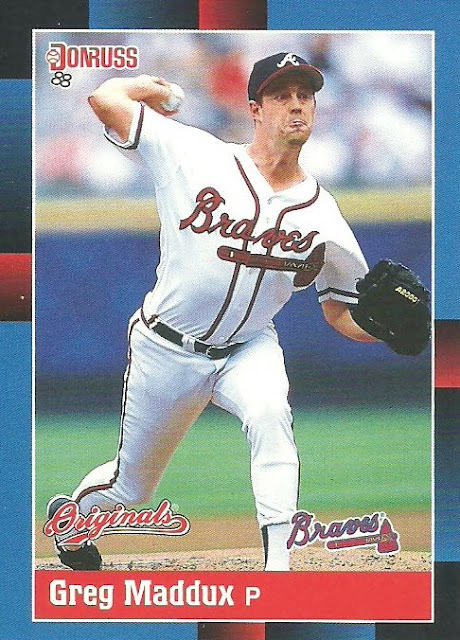 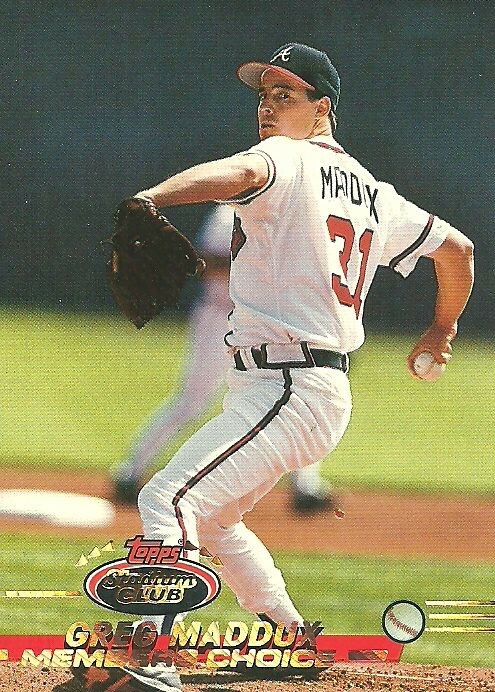 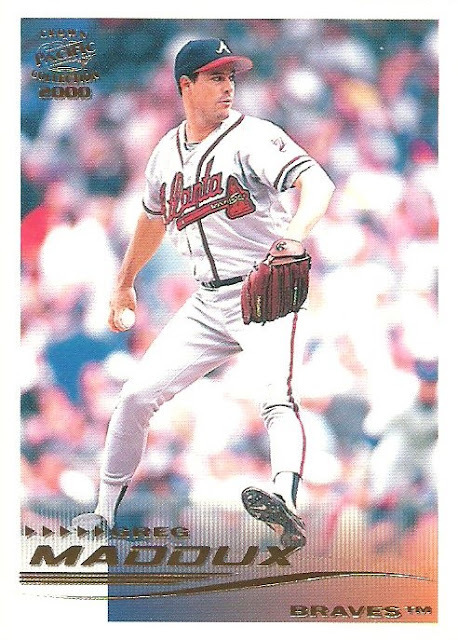 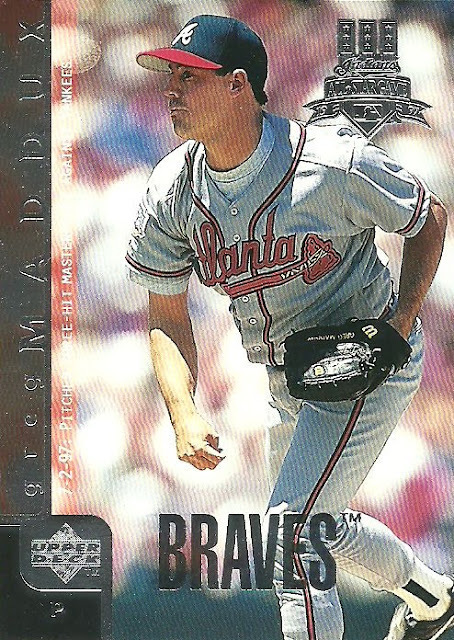 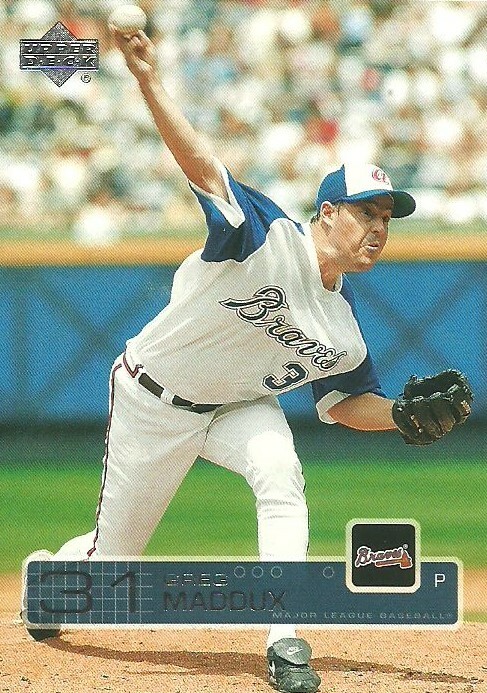 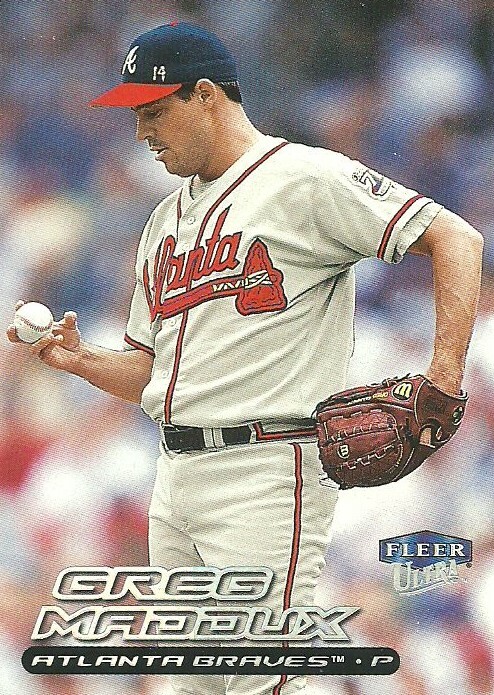 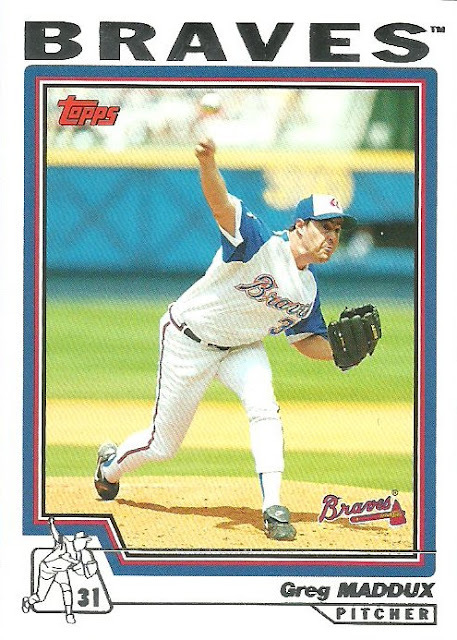 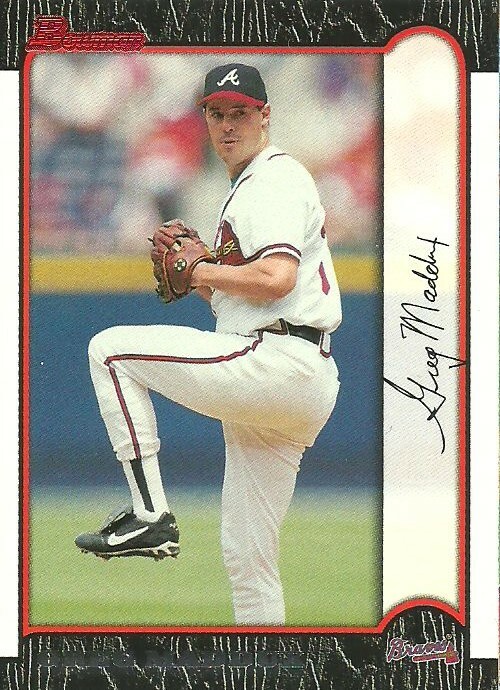 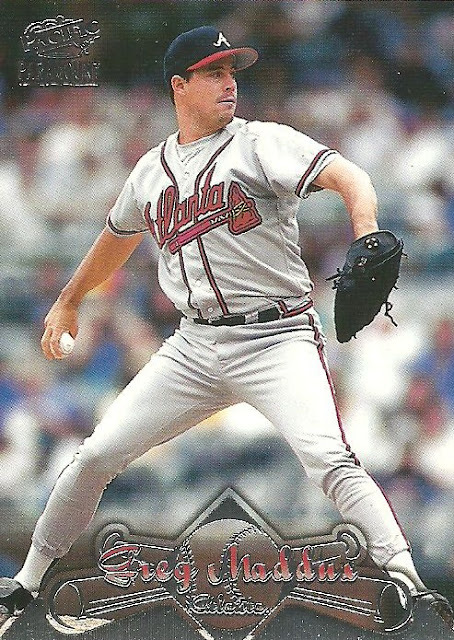 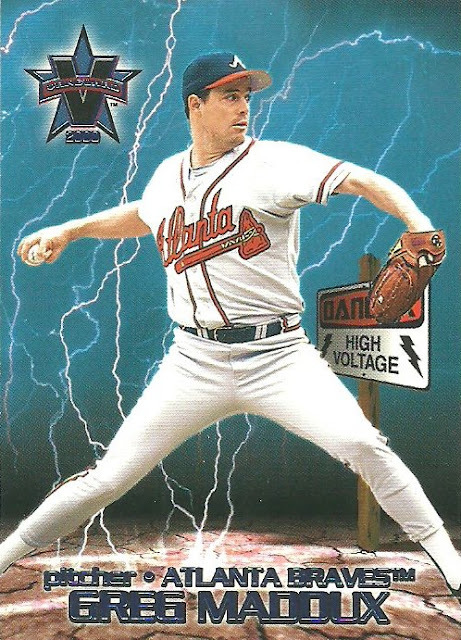 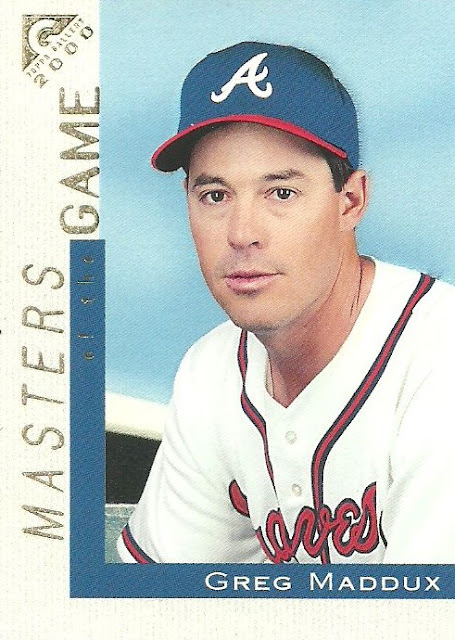 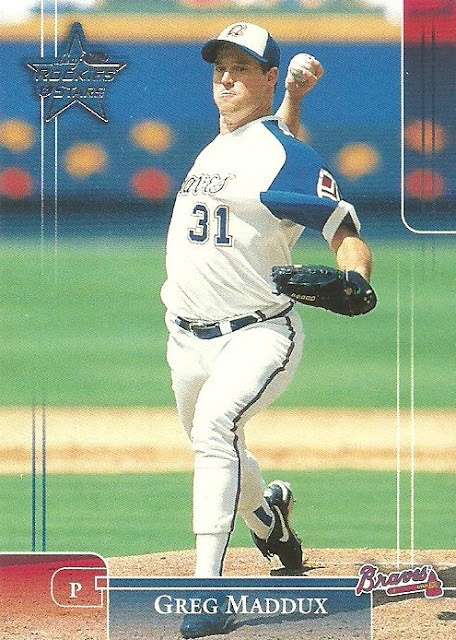 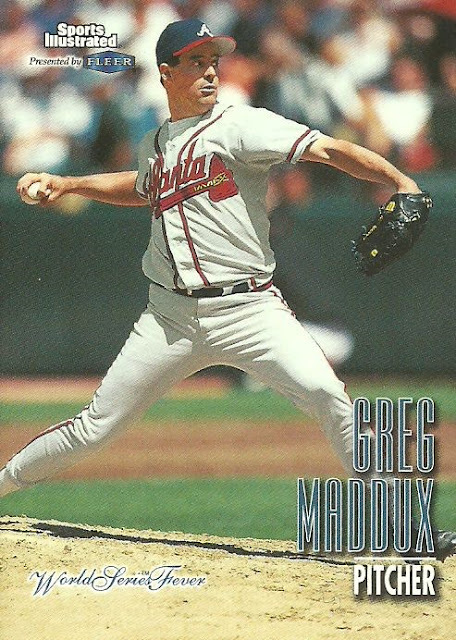 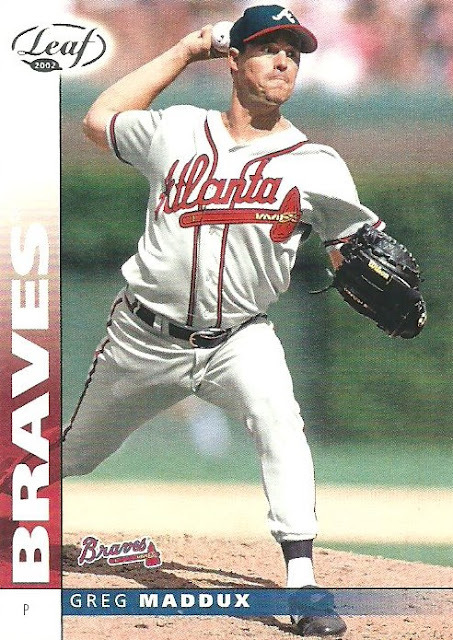 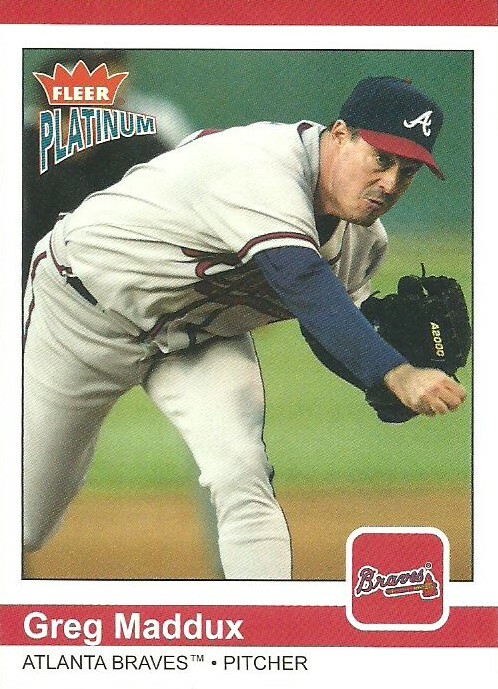 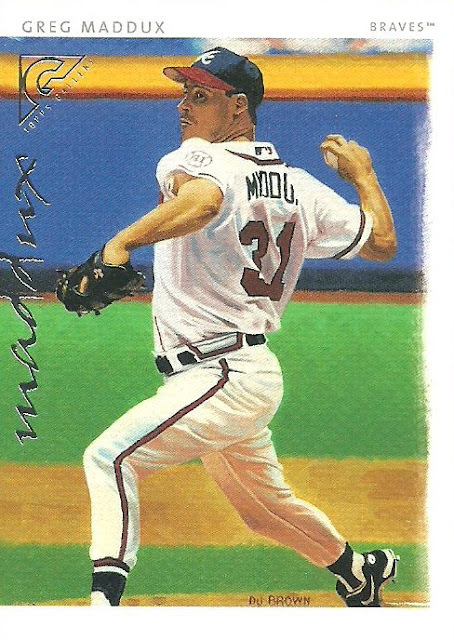 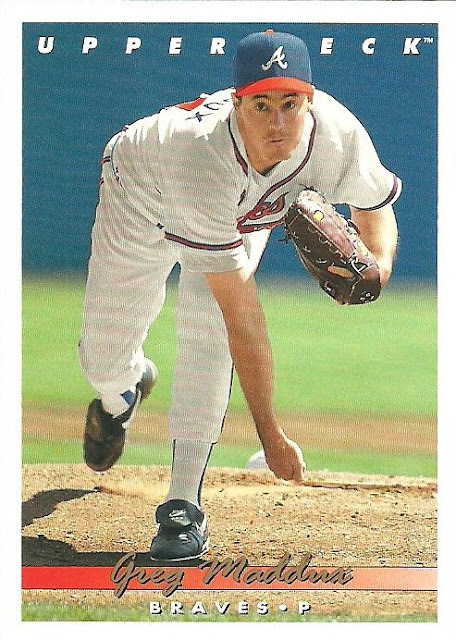 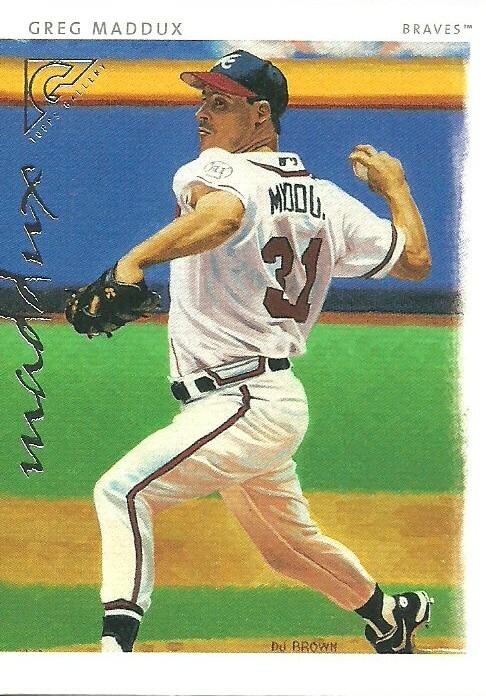 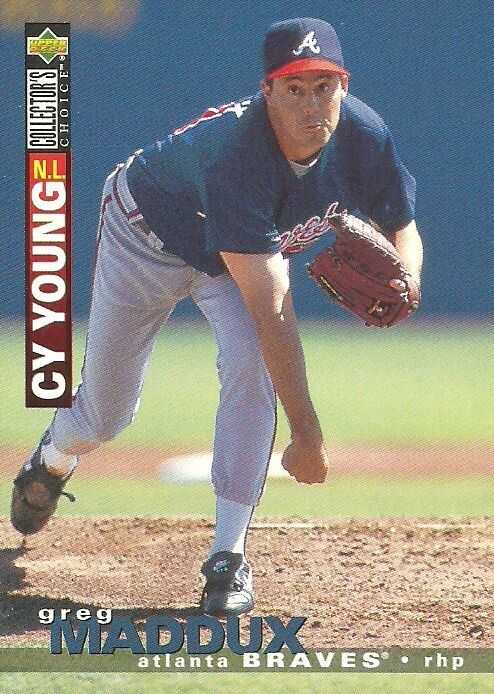 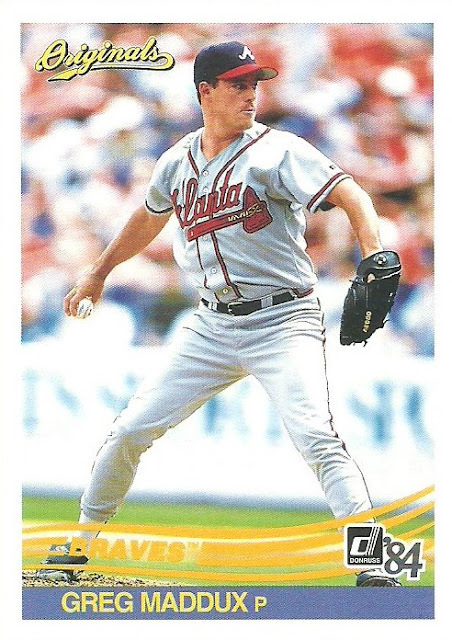 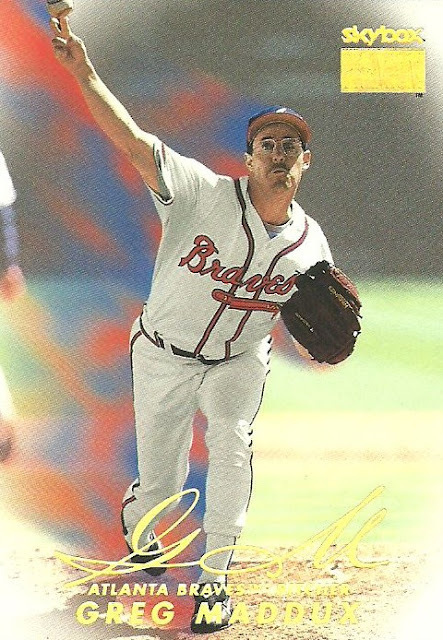 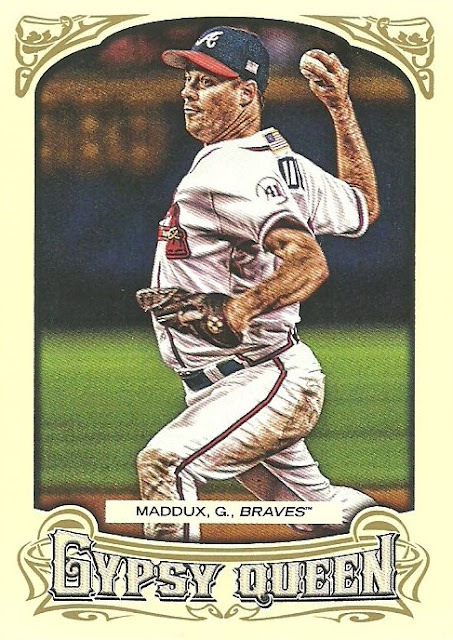 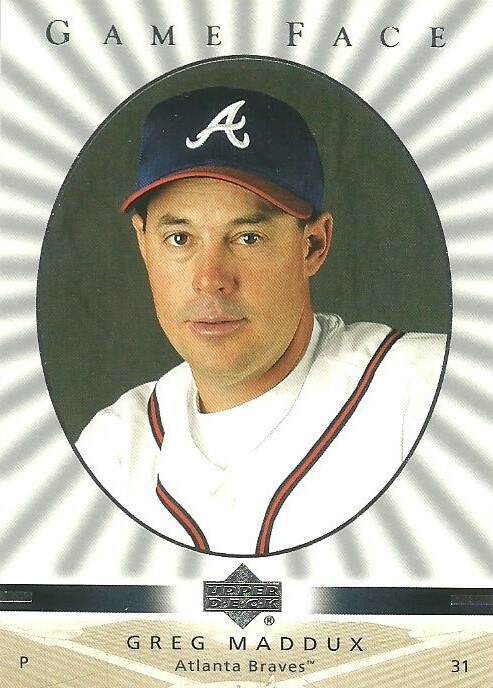 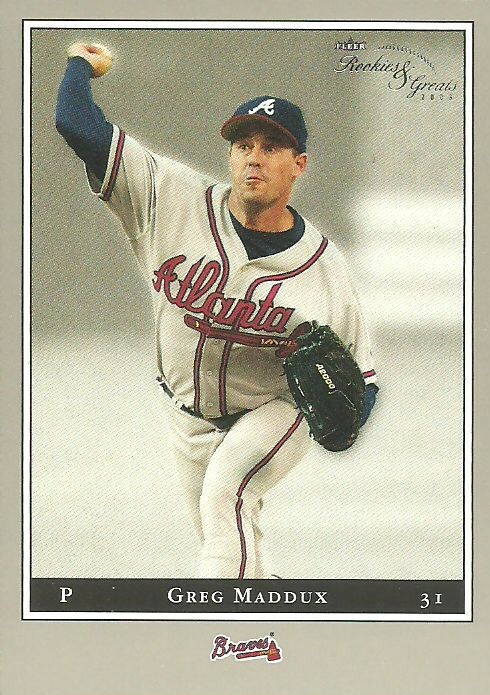 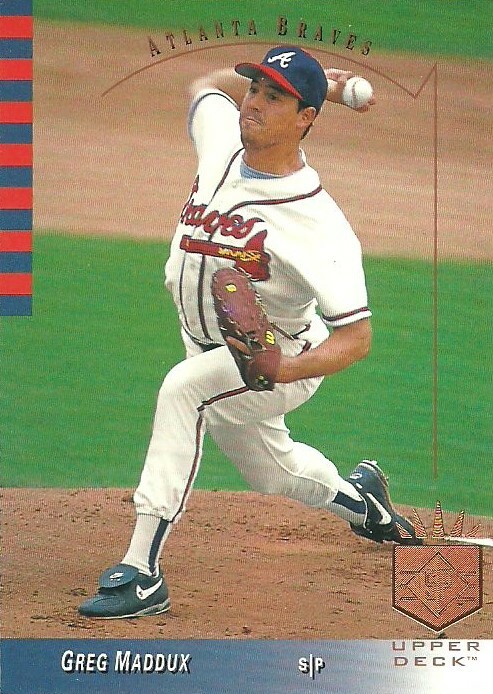 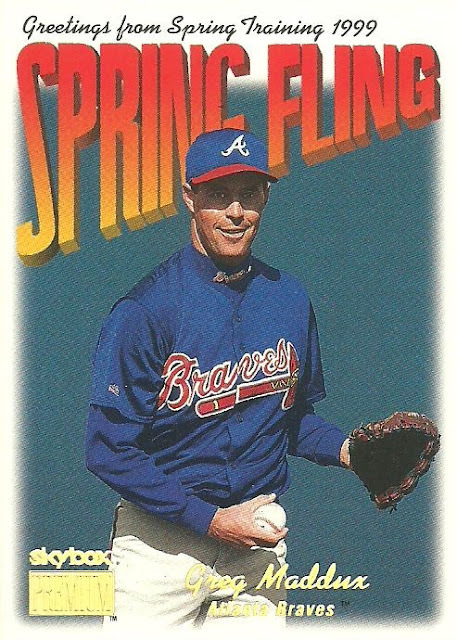 On today's date in 1997, Greg Maddux pitched a complete game beating the Cubs 4-1 while throwing only 77 pitches. 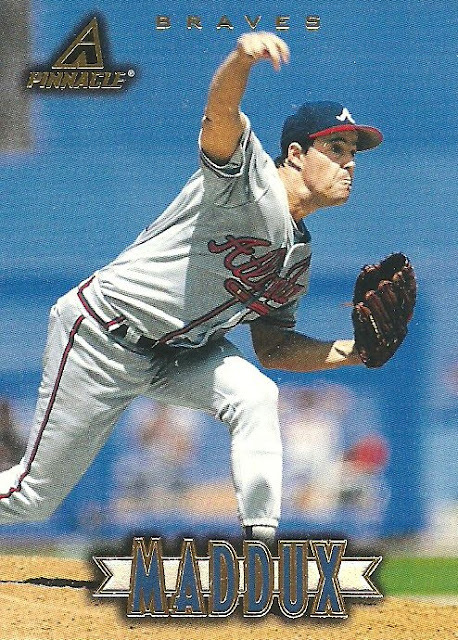 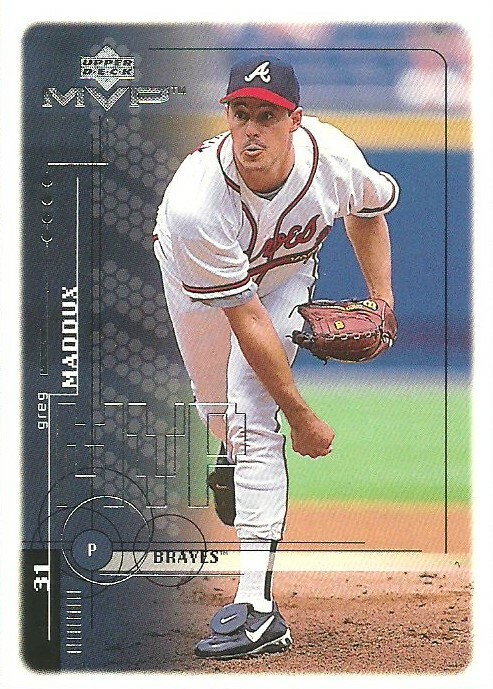 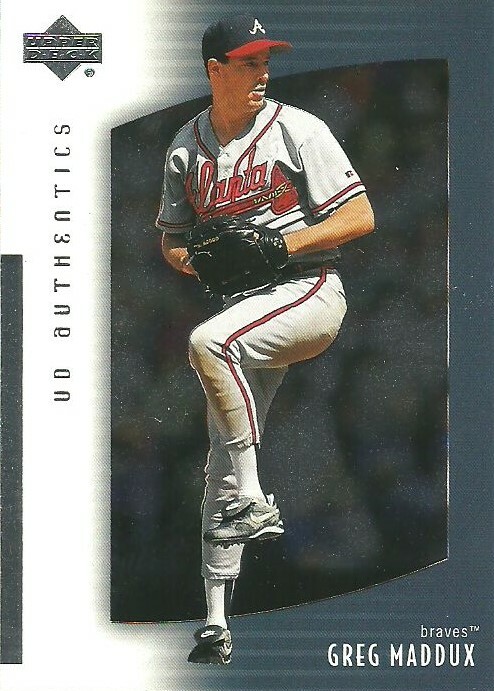 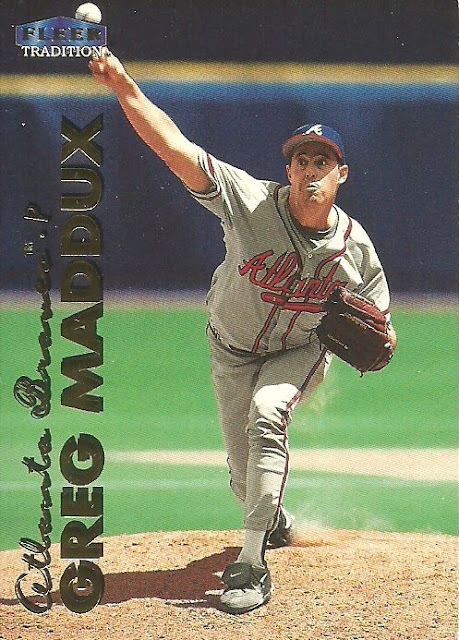 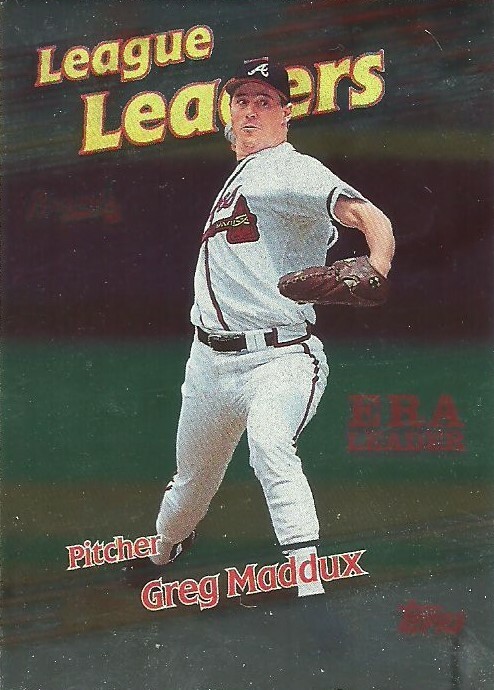 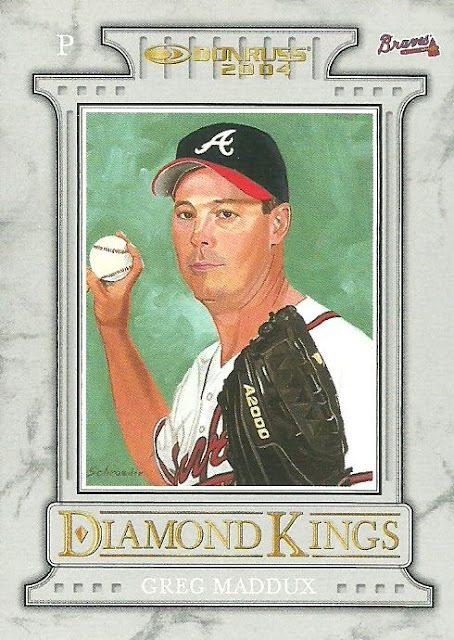 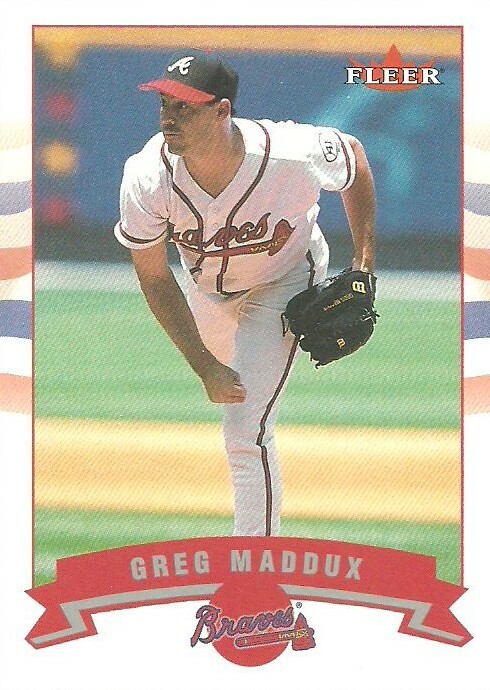 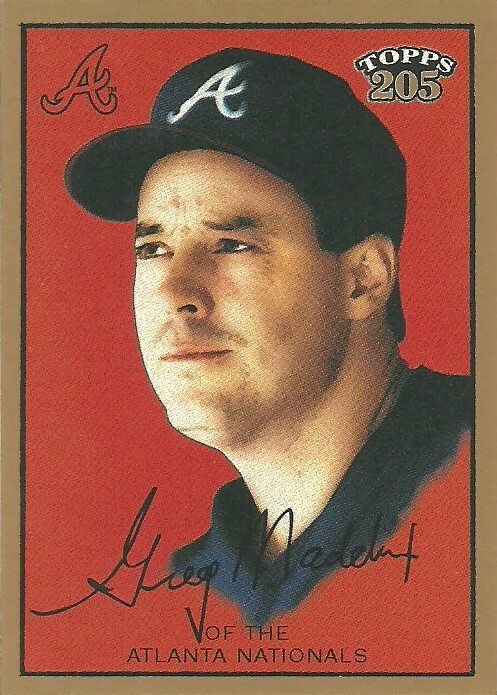 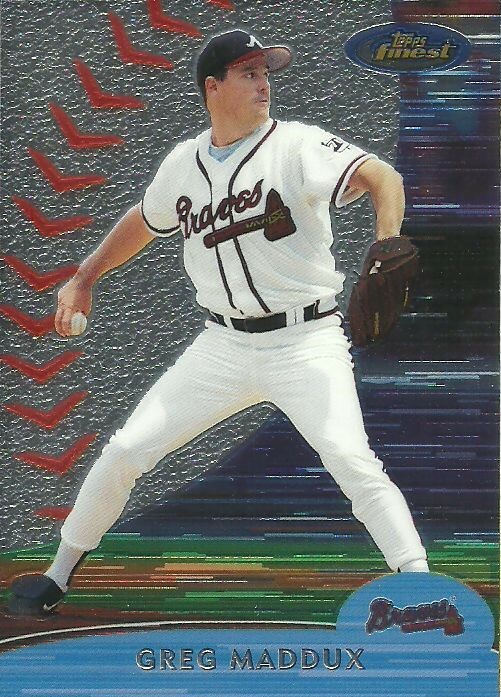 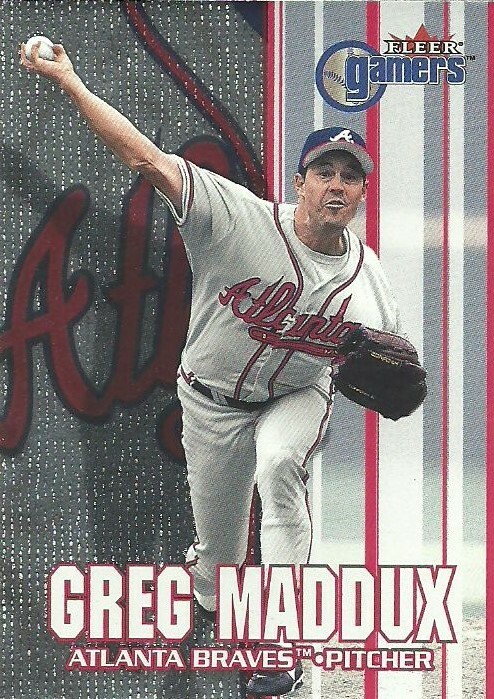 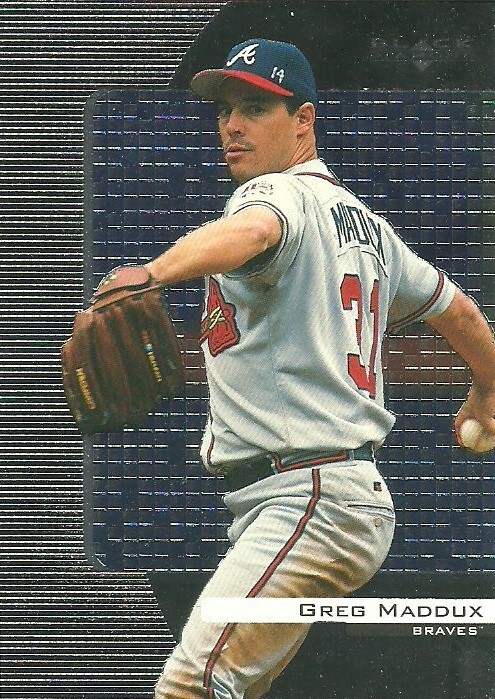 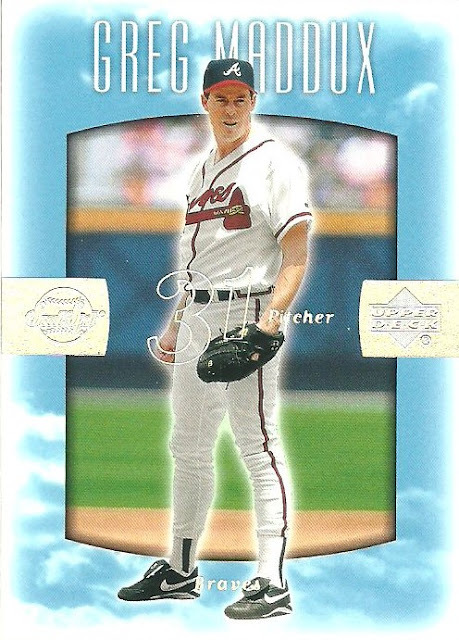 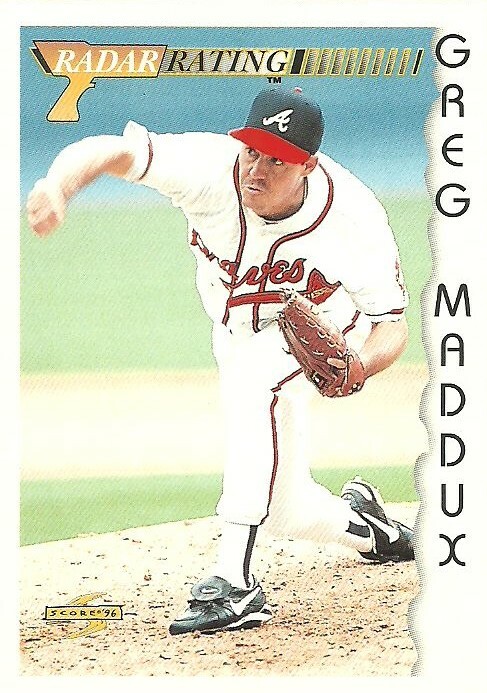 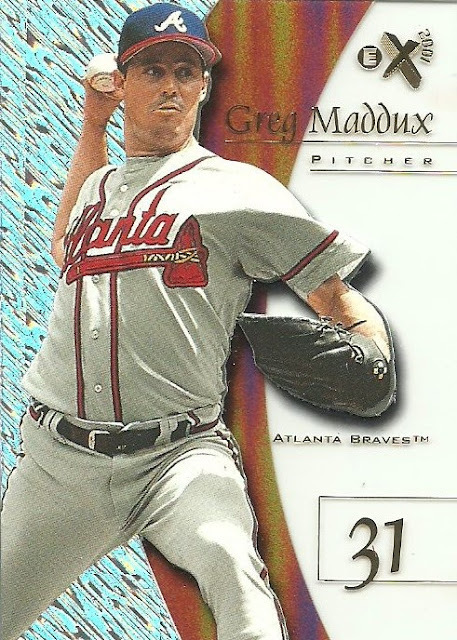 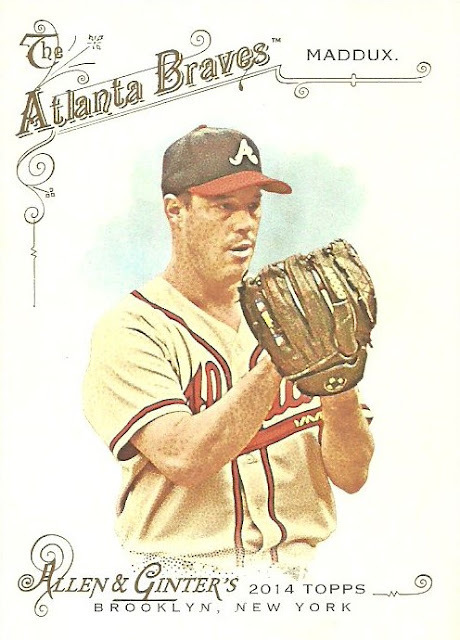 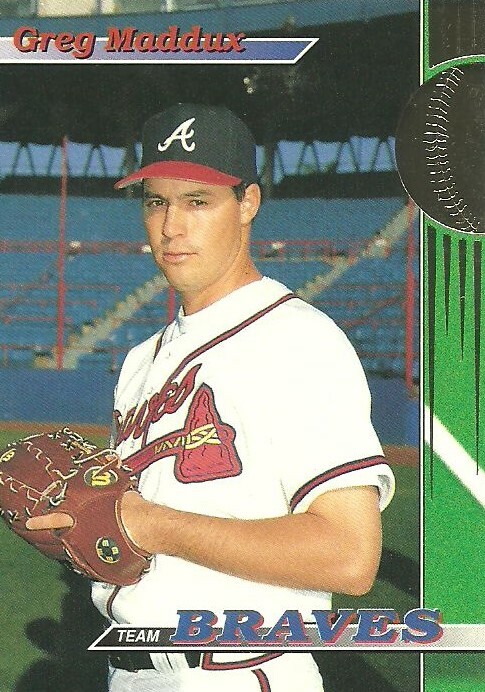 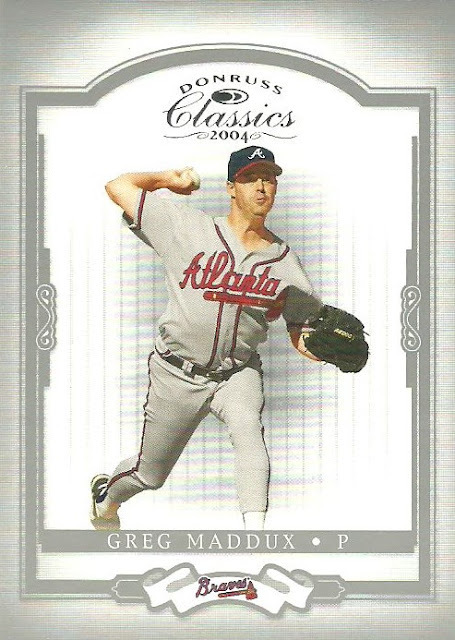 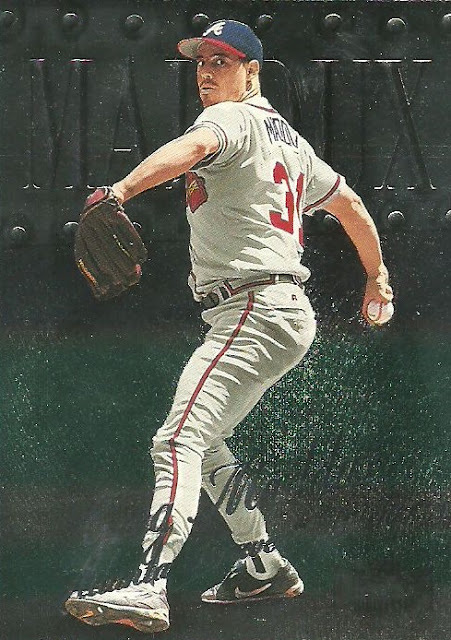 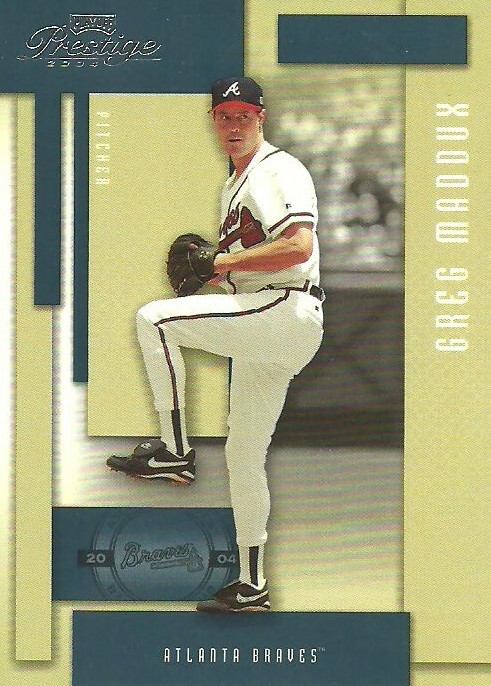 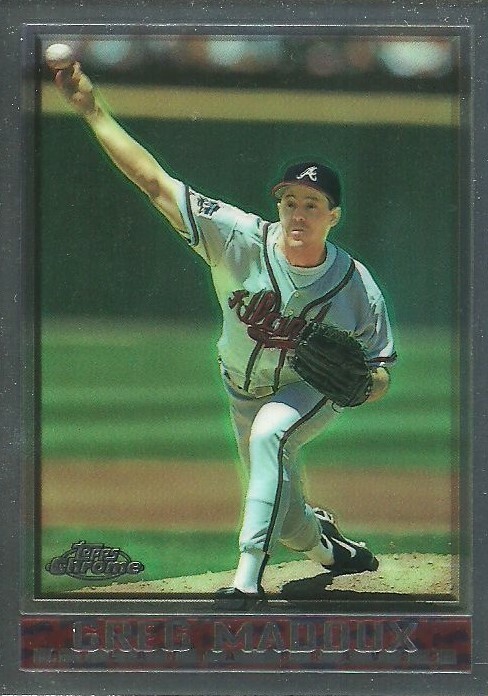 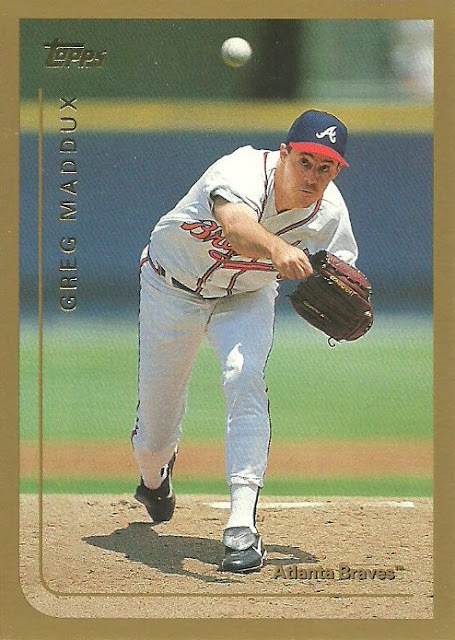 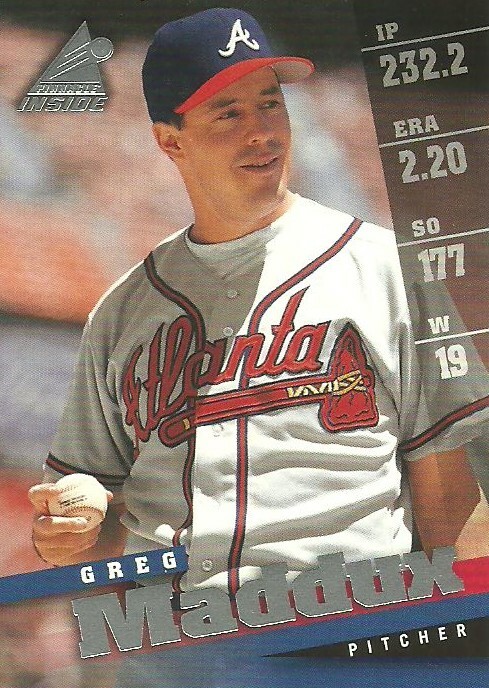 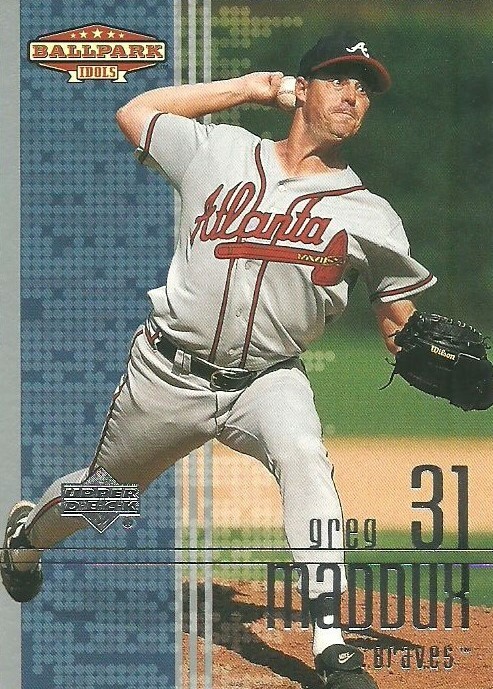 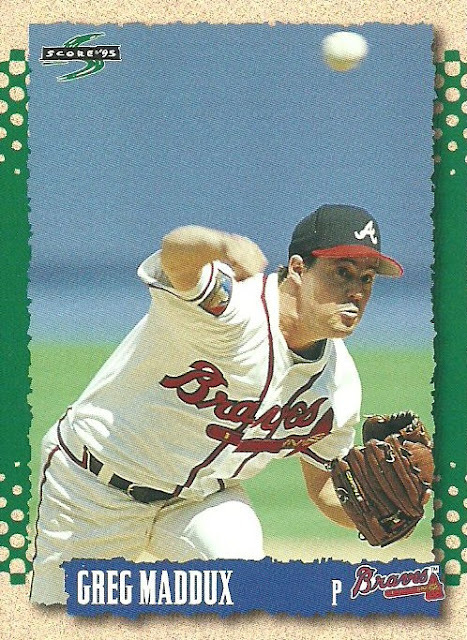 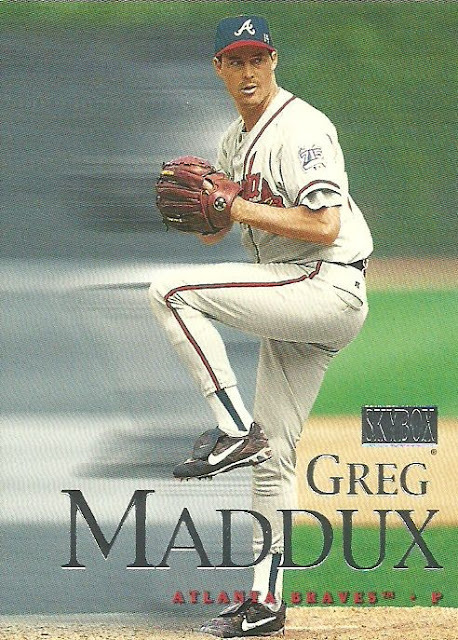 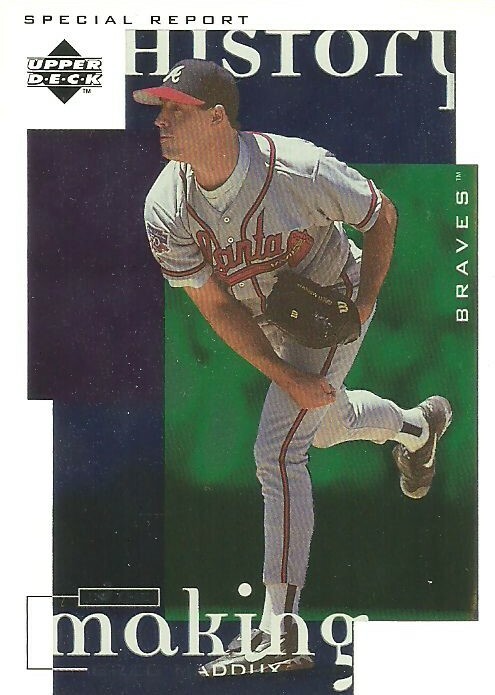 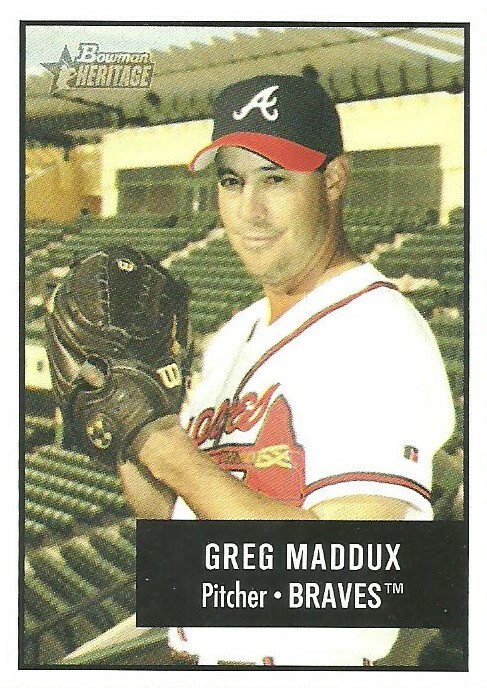 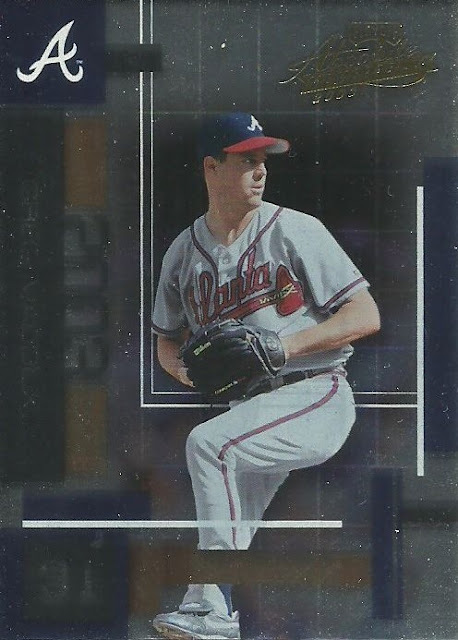 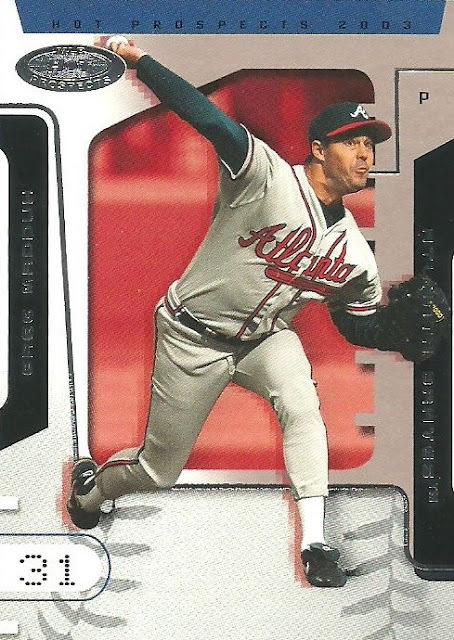 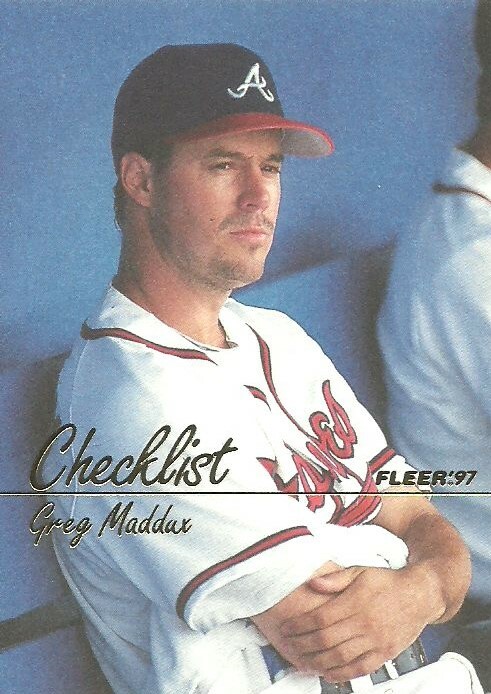 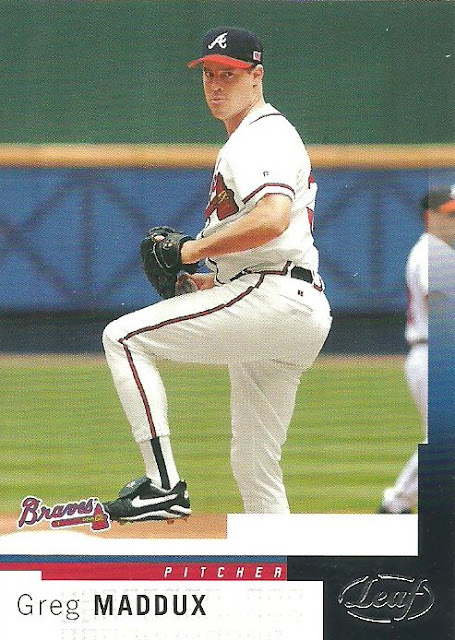 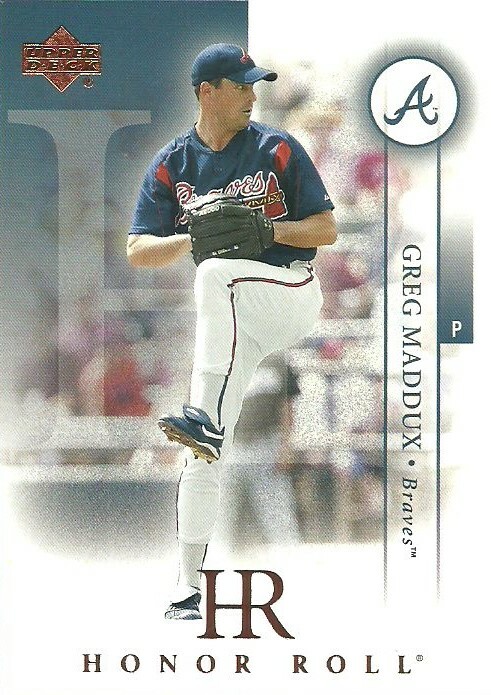 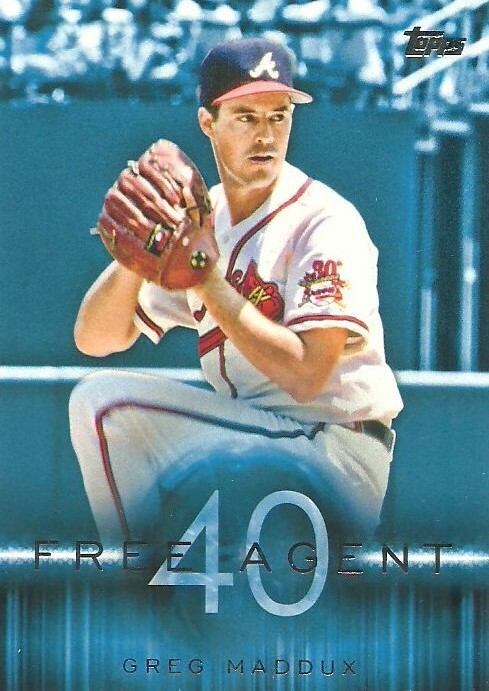 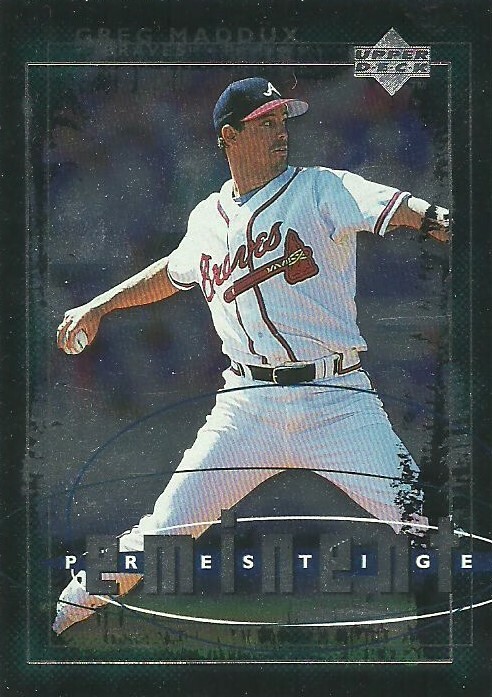 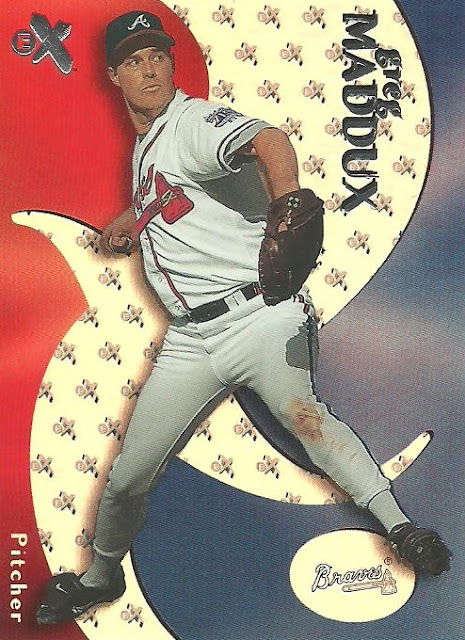 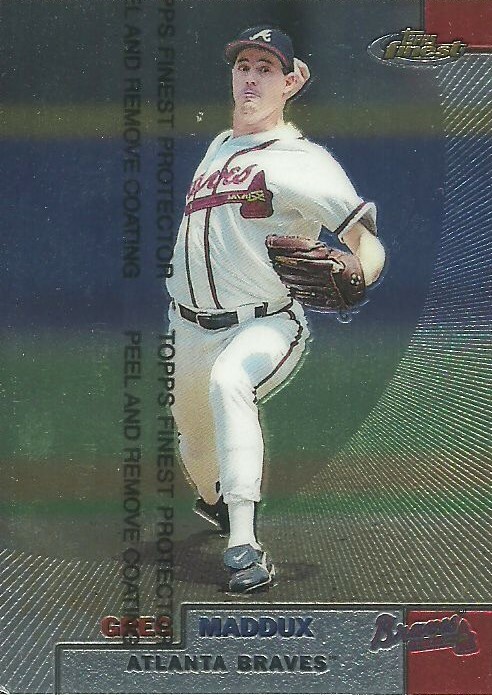 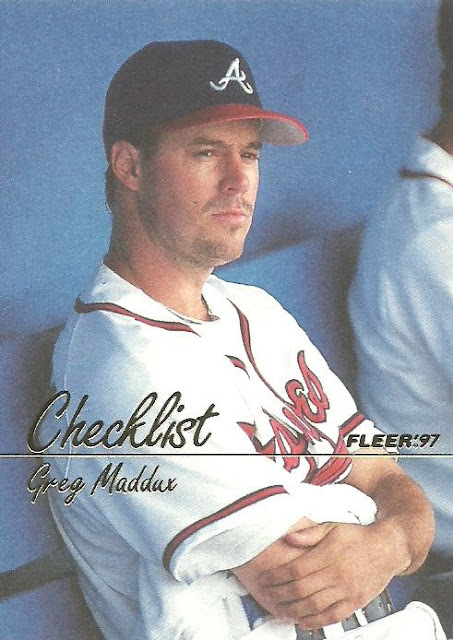 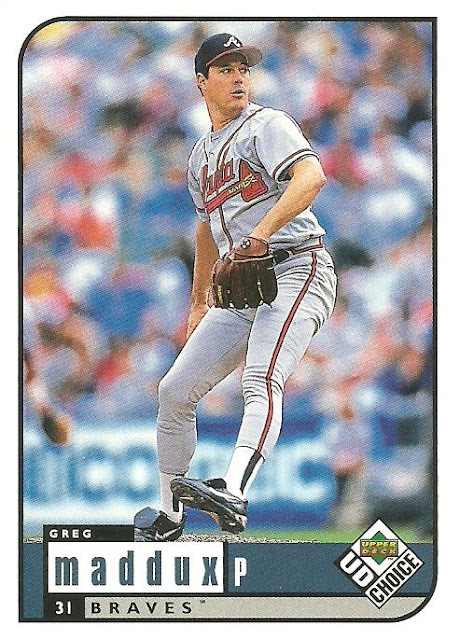 Here are 77 Greg Maddux cards.